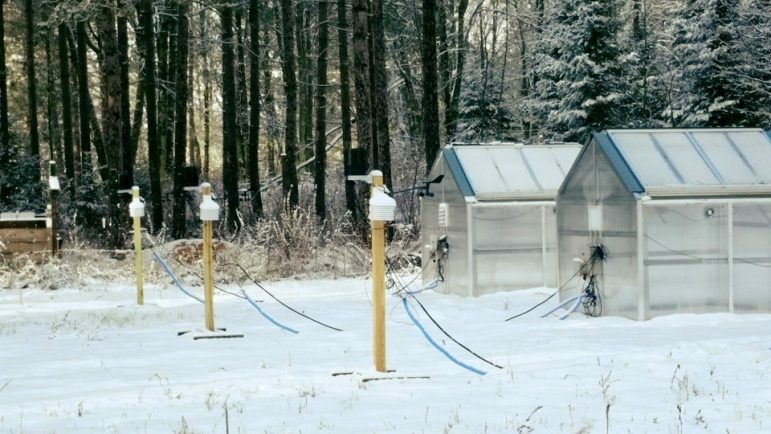 As the snow falls and winter winds howl, mini-research labs in three states will capture information this year to predict how animals and plants might survive Great Lakes winters without a thick layer of snow. Testing sites are in Madison, Duluth and Houghton, Michigan. The research could reveal how climate change impacts Great Lakes plants and animals, said Jonathan Pauli, an assistant professor of forest and wildlife ecology at the University of Wisconsin-Madison. This research is different, Pauli said. Scientists will explore what is known as the subnivium, the layer between the ground and snow cover, said Kimberly Thompson, a researcher on the University of Wisconsin-Madison project. Plants, insects, mice, frogs and other animals hunker down in the subnivium to survive winter and prepare for spring growth or breeding. It’s a space teeming with life and one that is unknown to many people. The subnivium protects life with relatively stable temperatures that are warmed by sunlight and by heat rising from the soil. Plants and animals remain in approximately 32 degree temperatures, said Thompson. That may sound cold, but outside this space the study areas all recorded temperatures below zero last winter. But this relatively unexplored inner space is changing with the climate. And scientists want to know what that means for the survival of the organisms that depend on it. The Intergovernmental Panel on Climate Change (IPCC) estimates global temperatures will rise 3 degrees to 12 degrees by 2100. The agency predicts that will have negative impacts on freshwater resources, food production and other climate systems. How species will react is uncertain, according to a recent University of Wisconsin study published in PLOS. That study concludes some animals may migrate north to preferable temperatures and snow conditions, as has been observed in other studies. However, those that can’t easily move north are vulnerable to population decline. An indoor lab at the University of Wisconsin will use micro-greenhouses to simulate the effects of climate change within the subnivium and help predict what could happen to various species, Thompson said. The 9-foot square greenhouses are automated to sense precipitation and temperatures, she said. When sensors detect rain or snow, the peaked roofs open to allow the precipitation to enter while gauges maintain the desired temperatures and signal if heating or venting are needed. Each site has three micro-greenhouses. One is set to the outdoor temperature, while the others are set slightly warmer to replicate future climate change scenarios. Scientists will study a variety of plants and animals living under the snow. One project examines how climate change might impact wood frogs, one of about a dozen frog species in North America that can freeze without significant stress to their bodies, said Larry Werner, a lead researcher on the project. The more a frog freezes and thaws with the snow, the more energy it uses, he said. According to Werner, energy is like money. Once it is spent, it takes time to replenish your wallet. In the meantime, you’re limited in what you can do. He investigates how frogs adapt to warmer temperatures and if their bodies can endure the more frequent freeze-thaw patterns caused by climate change in northern zones. 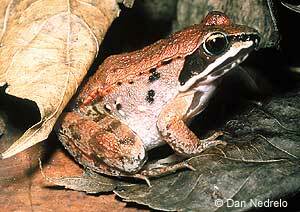 The natural habitat of wood frogs extends throughout the Great Lakes region and into Canada. Image: University of Wisconsin. Next year, scientists will use measurements from the micro-greenhouses and apply them to wood frogs refrigerated at the lab, Werner said. It will show how the animals might react in warmer weather and to more freezing and thawing. Researchers said the tree frog research is one example of the projects done at the lab. Others include research above the subnivium. A recently published a study found climate change is already impacting snowshoe hares, a species native to Wisconsin, Minnesota, northern Michigan and New York. 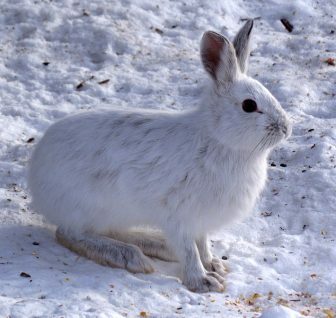 “Snowshoe hares are really linked into snow conditions. They turn white in the winter, but more and more what we are seeing in the southern distribution is they turn white, but there is not a lot of white behind them so that whole camouflage approach loses its benefit,” Pauli said. This makes them easy targets for prey. The research also found snowshoe hares are moving away from native areas and north to areas with more snow cover. Besides learning how climate change impacts species, researchers are investigating ways to offset the effects. One idea is increasing forest undergrowth to help maintain snow cover for plants and animals that depend on it, researchers said. “Those temperature profiles may not exist in the future, and finding out what that means and being prepared for it is going to be pretty important,” Werner said.